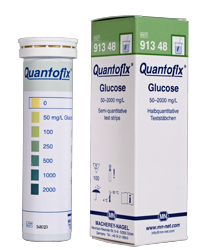 Quantofix Glucose - Water Analysis Test Strips The Quantofix Glucose test strip allows the quick and easy determination of glucose in solutions. 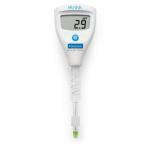 The easy Dip & Read procedure provides reliable results in less than 30 seconds. There is absolutely no training required. Glucose is an important part of many foods and beverages and hence it's determination is important in the respective industries. The test is for example especially suited for the potatoe industry, to provide quick and easy quality control procedures at the initial deliveries. Additionally, the glucose content in potatoes is an important quality criterion during storage, as the glucose content increases during long storage or at high temperatures, leading to loss of quality, discolorations and unpleasent taste. 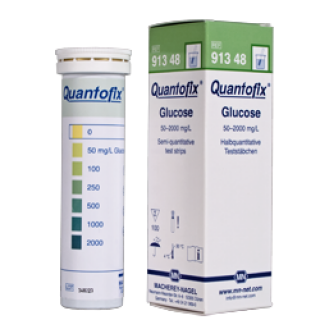 The Quantofix Glucose test strips are the ideal solution to test for glucose in solution or vegetables quickly and accurately.